Robert Gagno, a student in the Basic Occupational Retail Education Program, made the cover of 24 Hours yesterday. Robert was named by the newspaper as one of its Top 24 under 24 "best and brightest" students in the Lower Mainland. 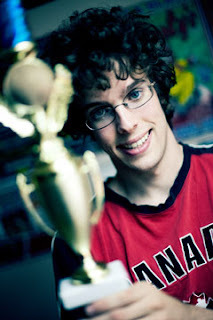 Robert, who has autism, was featured because of his outstanding pinball abilities - he's currently no. 1 in Canada and ranked no. 11 in the world. Robert was also featured on the Science Channel's Ingenious Minds earlier this year. Read his profile in 24. Last week 24 also featured Business student Rosie Hernandez as one of it's Top 24 under 24. See the post here.